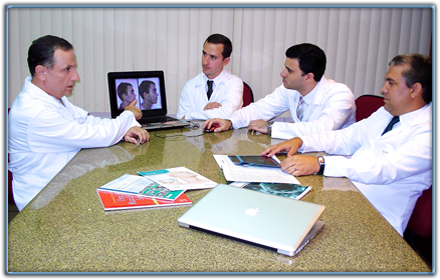 The professional team integrating the Center for Cranio-Maxillofacial Reconstruction consists of personnel with degrees in medicine, dentistry or both careers. 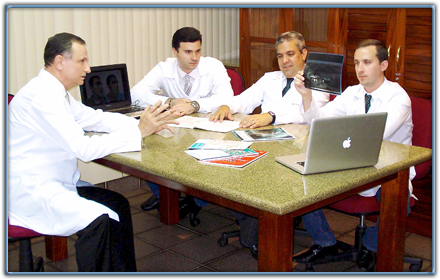 Members of the Service, holders of high level professional capacity, possesses postgraduate in its various levels and are Full Members of the Brazilian College of Surgery and Traumatology Maxillofacial (CBCTBMF) and Fellows of the International Association of Oral and Maxillofacial Surgeons (IAOMS). The Service has a routine of continued education, which is the basis for the constant qualification and consolidation of capacity. Inserted in constant training programs in surgical techniques aimed at resolution of deformities of the face and that also involve the use of biomaterials and skeletal fixation for stable employment Titanium (Ti) the principles of AO (Switzerland / AO Foundation / AOCMF), maintains a high level of update. As speakers and / or international instructors are periodically invited to activities at conferences, courses and workshops both in Brazil as Abroad. 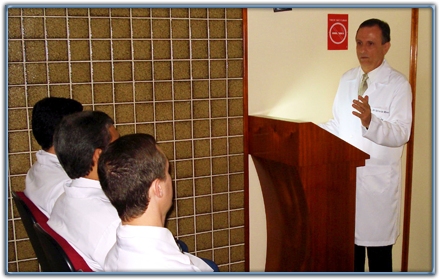 The group participates constantly in multi and interdisciplinary activities, together with other specialties. Such conduct reflects a higher quality of care for patients with congenital deformities of the face (single or multiple) and patients with facial trauma or polytrauma. The service keeps track of hospitalized patients through daily visits and "reports" on schedule updated, in real time, and conveyed through informatics tools. There is a practice routine to discuss, directed study cases and planning preparation in order to deliver results aligned with current quality standards. It's what makes the professional able to perform their duties. Training is understood as to prepare people to cope with situations related to their activity through the application of knowledge, but with the possibility to create, solve problems, provide alternatives for improvements and create appropriate environment. Enabling a professional means providing autonomy, create confidence and promote development. To enable a professional goes beyond training, it's training by means of mechanical repetitions, which develops a specific skill, with little freedom for expression of the individual's personality. Training develops competence, which is the result of knowledge, skills and attitudes, as well as the knowledge, competence is not transmitted. There is no one able to transfer their skills to another person. However, it is perfectly possible to help a person build their own competence in the same way that knowledge is built. The qualification provides results in a formation that makes a qualified professional to exercise some activity, that is, endows the person of a body of knowledge that attest to the possibility of professional practice. In this body of knowledge to include education, professional experience, conducting courses, etc. The qualification is the acquisition of theoretical knowledge, technical and operational related to the production of goods and services. This knowledge is important, but widespread. The acquisition of experience and courses are ongoing needs. Biomaterials is a field of application of polymeric materials and composites and can be defined as all materials which have an interface with biological systems to evaluate, treat, augment or replace any tissue, organ or function of the body. Often associated with the concept of biomaterials, materials of natural origin, best known for biopolymers, but this definition is not entirely correct, since there are biomaterials of synthetic origin that can directly contact the body, performing many beneficial functions in the area of health. Thus, the biomaterials are materials inserted in the human body to treat, ameliorate, or replace any tissue, organ or function of the body, and may be of natural or synthetic origin. A further essential definition of biomaterials science, is "biocompatible", which can be defined as the ability of a material having an appropriate response in a specific application, with a minimum of allergic, inflammatory or toxic when in contact with the t alive issues or body fluids. The biocompatibility involves the interactions of human tissues and fluids, including blood, with an implant or material. The interactions may be in the physiological environment or on the material or on the material action in the body, making it difficult to separate these two interactions. A biocompatible biomaterial should be in a specific application, so the biocompatibility specification must include the conditions of use and evaluation. Third Generation - tissue engineering (until today). The high strength, low weight, excellent corrosion resistance possessed by the Titanium and Titanium alloys led to a broad and diverse range successful applications that require high levels of safe performance in surgery and medicine, but also in plants aerospace, automotive, chemical, power generation, oil and gas extraction, sports games, and other specialized industries. Over 1000 tons of Titanium devices of every description and function are implanted in patients worldwide every year. The requirements for the replacement is growing in people living a long time, in people who have suffered damage in sports, or seriously injured in car accidents and other accidents. Lightweight, strong and totally biocompatible, titanium is one of the few materials that naturally have capabilities to be implanted in the human body.